Cañon City High School's 2017 CASB Student Leadership Strand participants met with board of education directors on Saturday morning to share opinions about how school is going. They include Matthew Logan, Emily Reynolds, Kate Tedquist, Cassidy Heimel, Gary Dean Smith, and Dawson Cloninger. Last week Cañon City High School Technical Writing instructor Madison Tortessi’s students completed a semester long project, culminating in the submission of a PTECH grant on behalf of the Cañon City School District. This grant is aimed at covering costs of college tuition for high school students who pursue careers in STEM industries after high school graduation. I want to thank Ms. Tortessi for thinking outside the box and providing her students the opportunity to engage in such purposeful work while meeting learning standards. Compliments are also due Regional Internship Coordinator Lisa Tedesko for conducting yet another internship- apprenticeship career fair last week. 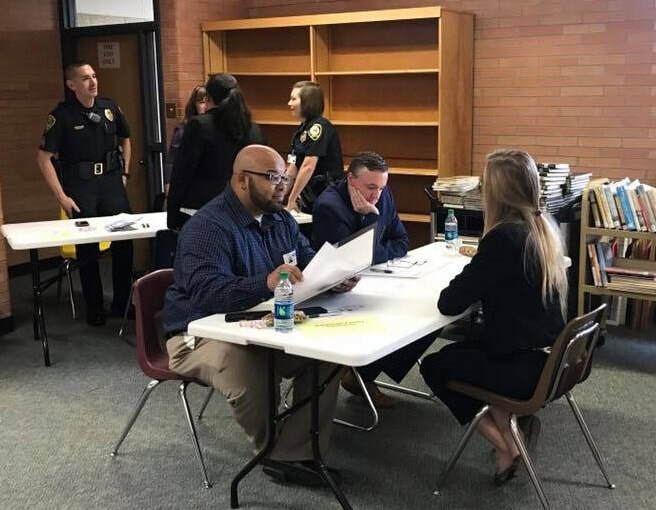 At the event 26 area employers interviewed 44 Cañon City High School students who were seeking internship opportunities during the spring semester of 2018. This work is key to Cañon City High School’s transition to a career pathways program because providing all students opportunities to engage in careers of interest is a major goal. On Friday and Saturday all five CCSD board of education directors attended the Colorado Association of School Boards (CAASB) annual convention in Colorado Springs. Lessons learned included potential revisions to the Colorado School Finance funding formula, how to turn around highly challenging schools, how the brain adapts during learning and growth, the importance of moving from a fixed to an open mindset, and the role adequate sleep plays in student learning and mental and physical health. The highlight of the convention was the board’s annual engagement session with student leadership strand participants, during which feedback was solicited about what’s going well and what needs to be improved in the school system. 26 local employers interviewed 44 Cañon City High School students last week for potential internship and apprenticeship opportunities. At Monday’s board work session Cañon City High School Principal Bill Summers presented a comprehensive plan requesting two high school early release days per-month during the 2018 spring semester. This would allow staff time to collaborate on refining pathways curriculum for the 2018-19 school year and to prepare for implementation of a one-to-one technology device program by August 2018. The board approved this request because it feels the large investment the district will be making in technology devices needs to be accompanied by intensive staff training and support. The board also felt comfortable with this decision because Cañon City High School’s currently scheduled student-teacher contact time well exceeds state minimum mandates. As off now, early release will take place on January 24, January 31, February 7, February 21, February 28, March 7, March 29, April 10, April 18, April 25, May 2, and May 16. On these days high school students will be released from school at 1:10 PM, allowing staff to collaborate without interference through 2:45 PM. To support this work, the Cañon City School District will run a special grade 9-12 take home bus route which will not affect other school transportation schedules. Related to this important work, the Cañon City High School Technology Deployment Committee met Thursday afternoon and selected several devices to inspect during the next few weeks before a final decision is made as to which will be purchased for all students and staff members. The committee’s near term goal is to put a new device in every high school teacher and instructional paraprofessional’s hands as early in the spring 2018 semester as possible in order to train and prepare for full school deployment come August. Also, last Monday the district publicized its search to engage the services of an Owner’s Representative organization to support the implementation of $7.5 million worth of construction improvements at five district schools. The projects this work will support include abating asbestos insulation and replacing remaining single pane outer windows with energy efficient ones at CCHS, Lincoln, and McKinley, replacing 28 leaky and cracked skylights on the CCHS gym, replacing 135,000 square feet of aged and leaky roofing at CCHS, CES, and McKinley, replacing rusting water distribution pipes and valves with modern polyethylene pipe in CCHS, Lincoln, and McKinley, installing keyless automatic entry systems, ADA buttons, and surveillance cameras at the main building entries at CCHS, CES, Harrison, Lincoln, and McKinley, extending the rear CCHS entry canopy to enclose the area between the art room and rear hallway to increase safety, installing Blue Button panic alarms in CCHS, CES, Harrison, Lincoln and McKinley, upgrading and make ADA compliant locker rooms and restrooms at CCHS and Lincoln, replacing 2,750 square feet of dangerous, non-safety glass windows in older hallway sections at CCHS with painted and framed drywall, replacing gymnasium and 1980s wing HVAC rooftop units at CCHS, installing new classroom intercoms/emergency communications systems at CES, Lincoln, and McKinley, abating and removing the asbestos laden modular building located on the playground at CES, and replacing all wood and rusting metal core outer entry doors at Lincoln and McKinley. Interested parties can learn more about this opportunity to work with us at this link http://www.canoncityschools.org/apps/pages/rfps_rfqs_bids Deadline for electronic submission is December 10th at 4 PM. CCSD Board of Education Treasurer Shad Johnson was a breakout session presenter this year at the CASB convention. Early in the week I worked to to catch up on digital communication I had fallen behind on during the Thanksgiving break. I also started to plan federal programs grant revisions that will be due in December, and attended a school board work session mainly focused on moving forward with 3A and 3B priorities. On Tuesday we conducted an instructional leader PLC focused on processes for addressing the needs of at-risk students, and authentically preparing all children for an unknown future. I then attended a Cañon 2020 visioning meeting that evening. On Wednesday I attended a Southern Superintendents gathering in Pueblo and then met with Parks and Recreation Director Jim Hoar about our Kids Klub program collaboration. I worked around the office on Thursday morning, then attended a school finance formula revision information session in Colorado Springs with Board President Larry Oddo. 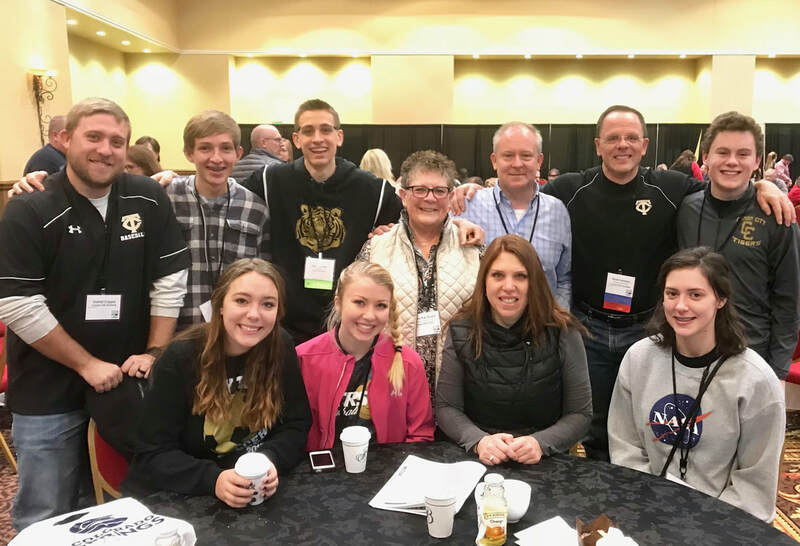 I returned to Springs on Friday and Saturday with the rest of the board of education to attend the Colorado Association of School Boards annual convention. At the CASB Convention Lisa Meltzer, associate professor of pediatrics at National Jewish Health, shares information about how adolescent circadian sleep and wake rhythms misalign with those of adults. This week I’ll conduct formal visits to four of our school campuses, attend to a number of district level student discipline matters, meet about McKinley Elementary School’s academic improvement plan, hold central office staff and operations staff meetings, attend a meeting about a community recreation center feasibility study, attend our annual classified staff Christmas party, and hold touching base meetings with Director of Special Services Lynnette Steinhoff and Director of Instruction Adam Hartman.